Remember, the point of our projections is not to predict the winner, but rather to access the accuracy of public polling. That being said, the hope is that our projections are accurate under the assumption that the polls were accurate. I'll also be recording the historical real-time result; I'll try and post a graph every hour or so depicting the vote totals as a function of time. Christie's (R) decline seems to be linearly associated with Daggett's surge while Corzine's (D) support has remained consistent. The most recent sample points do however illustrate a departure from this correlation; Dagget's and Christie's numbers have declined in the last week while Corzine's have increased. 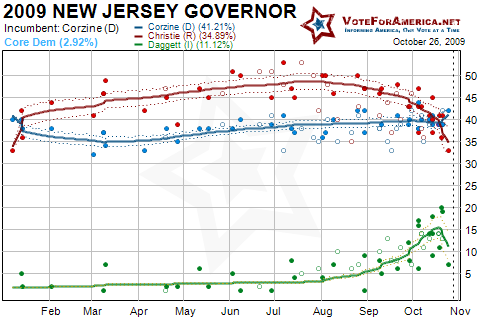 Christie's earlier support seems to have migrated to Daggett, and now that Corzine is back in the race, some Daggett voters are shifting to their second choice, Corzine. In the next week I expect a minor Christie resurgence, and a solidification of Daggett's support around the 15% threshold. I expect both major party candidates to head into next Tuesday's election hovering around the 40% mark. Deeds and McDonnell were generally polite, although they interrupted each other several times in a series of feisty exchanges made possible by an open-ended format. When the moderator asked Deeds which taxes he would support increasing, McDonnell tried to jump in: "I can answer that!" "No, you can't!" Deeds responded, glaring at McDonnell before saying that he would consider raising any tax tied to transportation funding. Still, the lively 60-minute debate appeared to do little to change the dynamics of a race in which Deeds trails McDonnell in public opinion polls, fundraising and advertising. The questions covered mostly familiar ground, and there seemed to be no game-changing moments. Deeds was basically defeated in every aspect of the campaign, and his polling numbers reflect these various deficiencies. Our mathematical projection gives Deeds less than a 1% chance of victory, and from a purely logical standpoint, this seems realistic. Deeds has lost, unless something absurd happens. The third and final debate in the tightening New Jersey governor's race turned into something of a free-for-all on Thursday night as Gov. Jon S. Corzine tried to portray the state's battered economy as poised for a slingshotlike recovery, while his Republican rival, Christopher J. Christie, depicted him as lamentably out of touch. But the two were constantly harassed by a pesky Christopher J. Daggett, the independent candidate, who pointed to a new poll that showed him within striking distance, and who taunted Mr. Corzine and Mr. Christie over property taxes, corruption and the environment. The hourlong debate, broadcast on the jazz station WBGO in Newark, broke little new ground, but allowed the three men to deliver their closing arguments. The latest fundraising filings from New Jersey have not yet been posted, although the 11 day deadline has passed. Hopefully the data will be available next week. In the meantime you can read through last period's reports at the New Jersey Election Law Enforcement Commission. 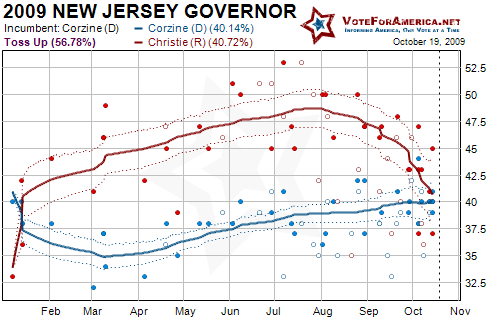 Corzine bankrolled his own campaign, while Christie and Daggett relied upon matching public funds. As a result Corzine had the capability to out raise his opponents, which he has done up to this point and I see no reason why this trend when end with the release of the new data. More in a week for our probably last polling update. I'll also, hopefully, have a few other surprises. 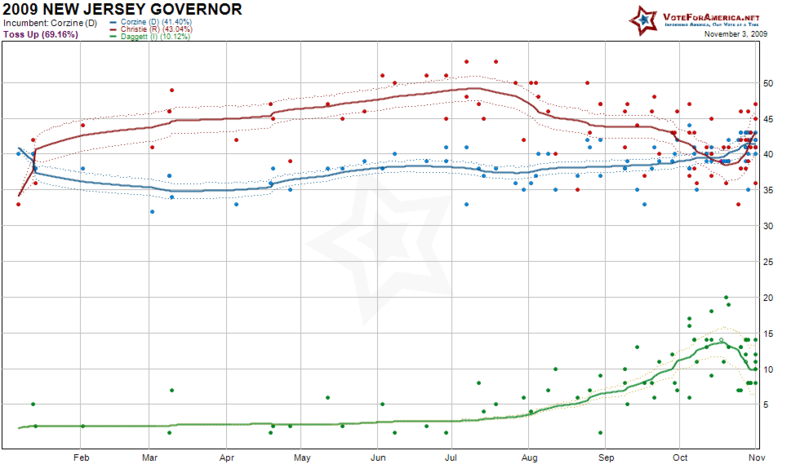 Based upon the frequency of new surveys, most pollsters seem to have given up on the Virginia Gubernatorial election. 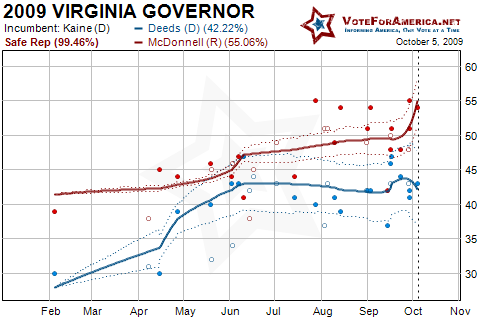 Deeds (D) has led in just two polls since January, and currently trails by about seven points. Corzine, on the other hand, has done a much more effect job of closing his summer gap. During the debate, McDonnell (R) sought to tie Deeds (D) to the push by the Obama administration to reduce emissions blamed for global warming through a limited number of permits that companies could trade and sell. McDonnell said the plan would raise utility costs by $1,700 per family, a claim that the Annenberg Public Policy Center's Factcheck.org has said is "not true." Deeds said McDonnell "wants this campaign to be decided on issues he's going to lie about." The issue of taxes seemed to have been largely ignored as was McDonnell's old graduate thesis. 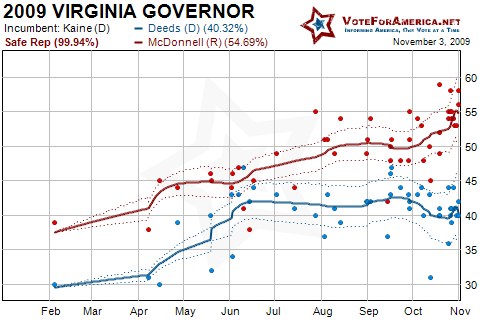 The focus of the debate was the state's economy; Deeds stated that Clinton and Obama better served the state's economy while McDonnell stated that the Bush's had done a better job. It's interesting that McDonnell explicitly stated that he support Bush era policies even though the state in which he is seeking has office voted against Bush's party for the first time in 44 years. Gov. Jon S. Corzine (D) chastised his two rivals (Christopher J. Christie, the Republican, and Christopher J. Daggett, the independent) for "trying to pretend that the recession is only in New Jersey," and warned that Mr. Christie would offer tax cuts to wealthy individuals and big businesses at the expense of middle-class families. Mr. Daggett criticized the governor's policies on taxes and spending and ridiculed Mr. Christie for proposing a variety of tax cuts without explaining what budget cuts he would use to pay for them. Mr. Christie, who focused most of his critique on Mr. Corzine, was not about to be upstaged by Mr. Daggett, who put in a strong performance in the first debate and has seen his poll numbers rise while Mr. Christie has seen his drop. Corzine appears to be aptly positioned to take the lead heading into the final weeks as Dagget continues to poll strongly. 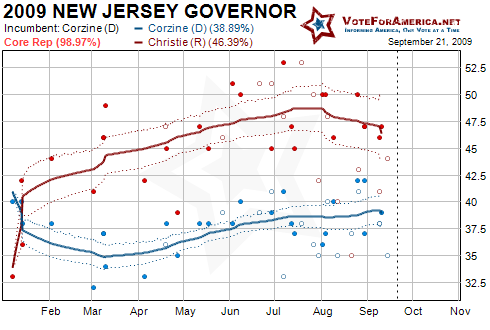 It's neck and neck, but Christie is trending in the wrong direction. 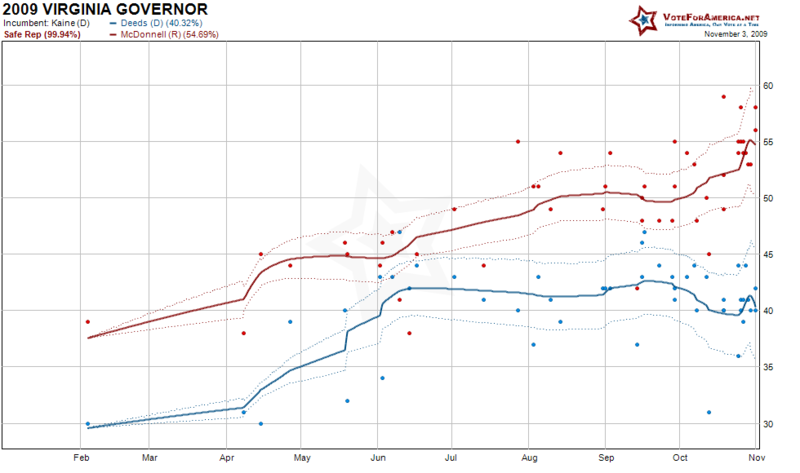 The New Jersey race strongly mirrors Minnesota's 2008 Senate contest based upon the trend lines and the emergence of a legitimate third party candidate. 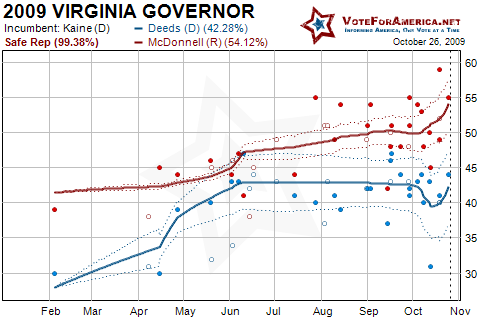 There is tentatively one more Virginia debate, and the potential for two more New Jersey debates; the next of which will be on Thursday. I first want to talk about the upcoming debate in Virginia. The debate started at 8 PM ET today, and is sponsored by the League of Women Voters and AARP. If you live in the Virginia viewing area, the debate should be broadcast on the NBC affiliate. This is a big stage for Deeds; he needs to directly address the issue of taxing as it relates to his transportation plan. He stumbled last debate and it appears to have hurt him in the polls. He must clarify his position if he still hopes to emerge victorious in just three short weeks. Moving North up the Atlantic Coast, the Lieutenant Gubernatorial candidates in New Jersey debated last Thursday. NJ.com has a brisk recap if you're interested. The discussion was apparently very heated and at times focused on Christie's (R) heavy set physique. I don't think this debate matters in any way shape or form. It's an off year election where most of the voting population probably hasn't tuned into the top of the ticket debates, to think that the Lieutenant Governor's debate affects public opinion is probably a step too far. The newspaper's decision is less a rejection of Gov. Jon Corzine and Republican Chris Christie than a repudiation of the parties they represent, both of which have forfeited any claim to the trust and confidence of the people of New Jersey. They share responsibility for the state's current plight. This is excellent news for Corzine, perhaps better than had he himself been endorsed. 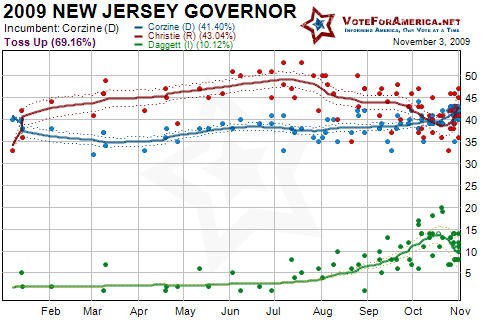 Dagget (I) appears to be drawing a fair amount of support away from Christie, while Corzine's baseline has remained steady. Dagget's (I) support seems to have consolidated after his esteemed debate performance on the first of the month. The next NJ debate takes place this Friday, October 16th. The three leading candidates will again take the stage, but this time at William Patterson University. The debate will be broadcast on TV and online through the NJ Network (PBS). 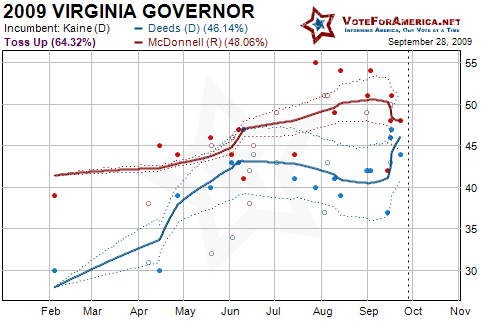 I'll try and update the graphs to reflect Dagget's numbers but I'm not making any promises. More in a week. If the race turned only on Corzine's record, he would probably lose. But Christie has vulnerabilities as well. He is a former U.S. attorney who made his reputation prosecuting politicians of both parties, and he has used those skills to prosecute the case against the incumbent. 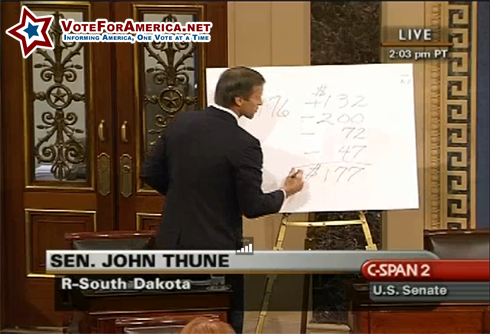 But he has yet to offer a credible plan to solve the budget woes. The next governor will face a budget deficit estimated at $8 billion. Christie has pledged he will not raise taxes, but cannot say how he would balance the budget without new revenue. He has identified possible areas, to cut but they fall short of what is necessary to get the job done. 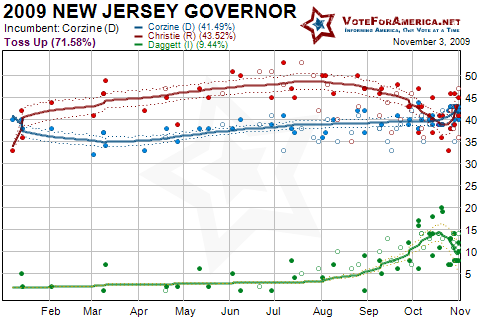 Corzine and independent candidate Chris Daggett scoffed at Christie's remedies. "Mr. Christie has no plan," Corzine said. "It's a fantasy." Daggett, who would cut some taxes but also significantly expand the state sales tax, chimed in: "It's easy to criticize when you have no plan of your own. . . . The tooth fairy is not going to come to solve this problem." The New Jersey election seems to have been reduced to the following question: Would you rather stay on the current path, or try something completely new and unquantifiable? In the 2008 presidential election, New Jerseyans choose the later, by electing Obama, but will they remain loyal to the incumbent Democrat? Creigh Deeds simply needed to take a position on whether to raise taxes to pay for his transportation plan, and he imploded. I don't think either position would have necessarily hurt him politically, but choosing and then changing his position definitely wasn't a good idea. The next debate is October 12th, and he better be prepared to clarify his position, by simply choosing a position, or he will lose this election. 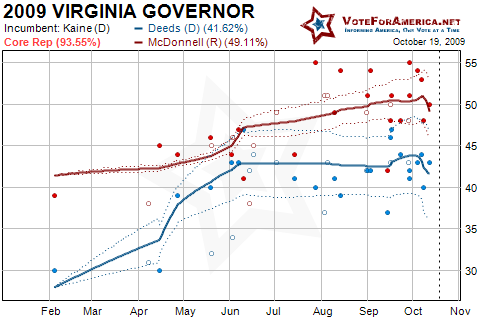 This week I want to focus on the debate schedule for each gubernatorial election; I'll begin with Virginia. [*] Appears to have been canceled. Both Virginia campaigns are still debating about the debates, so things may change going forward, but for now this is the schedule. Now onto New Jersey and their more organized debate schedule. Independent candidate Chris Dagget will also participate in all debates held within New Jersey. There will also be a debate between the Lieutenant Governor candidates on October 8th sponsored by the Leadership New Jersey Consortium. If you live in either New Jersey or Virginia I would highly encourage you to participate in the electoral process by watching or listening to the debates.